Wild Zero: Greatest Movie Ever or simply Most Amazing Thing Your Eyes Will Ever Behold? A while back I read a review at Chris's Invincible Superblog for the movie film "Wild Zero", and, immediately, I added the movie to my Netflix queue. This movie doesn't just have a little something for every audience imaginable, it was as if someone took everything that would be cool in a movie, and then went and made that movie. It's not enough that this is a movie featuring rockin' Japanese Punk/Rock'a'Billy outfit, Guitar Wolf. Mere words may not convey the rocking perfection of Guitar Wolf, and this post is not ready to contain my maserplan to henceforth shape my life to be like unto either Bass Wolf or Drum Wolf, the two best supporting characters in filmdom. Really, any scene featuring the heroic trio of Guitar Wolf is filmic perfection, from their flaming microphones to their coif-maintenance in the most dire of circumstances. Also, icy-cool, leggy, weapons-dealing soldiers-of-fortune in curiously hounds-tooth-printed one-piece outfits are always (I repeat: ALWAYS) a must for your perfect movie. Especially when they take out zombie home invaders who surprise them in the shower. Wild Zero is also a superhero/zombie/UFO/romantic/musical/action movie. And it believes in Rock 'n Roll in a way I have not seen in a movie in decades. Also, UFO's and blue, shambling zombies. And true love. If, at this point, you were having doubts about the movie, the inexplicable ending of the movie (which i refuse to give away) has the most awesomest scene ever committed to film. Ever. I dare you to find a better ending. 'twas a busy day for The League. I go to work an hour early, and could have probably used more time than that for the crazy day I had. Included two photoshoots, a release, and all sorts of additional mayhem. We use actors for certain parts of our work at my company, as well as photographers and lights and a green screen and stuff. It's all very exciting and technical and exactly why I went to college. But today we were down a talent, and so I was asked to step in not just as a producer, but as Angry Customer. So, The League got pose. And be hugged by one of the talent who was having, perhaps, too good of a time working on my project. Look, you work on one of my projects, and you're just going to want to hug me. That's how it works. That's the sort of project manager I am. Anyhow, I'm contacting my lawyer to see who I can sue. Keep that in mind, Leaguers. Anyone touches you or looks at you funny at work... retain an attorney. Immediately after work, Steven and Lauren popped in and we all headed out for some dinner at a place that used to be Mars, but is now an Italian place with a name I cannot recall. The food was good. The staff friendly. And I assume we were annoying other diners with our loud conversation about how sitcoms rely on scatological humor vis-a-vis the writer's strike. It seems the writer's strike is a hot topic. And will be affecting us in weird ways. Today I heard that we may not see many new commercials as writers won't be around to write those. Also, one of the actors we used today usually lives in LA, but she's hanging out at her mother's in Austin because she knows she can work here, but probably can't in LA right now. It was also new comic day on Thursday this week. And DC put out about a month's worth of comics in one day. I assume they are trying to get stuff out before Year's End. Anyhow, I have too much to read. But I lived the wrap-up to the Superman "Camelot Falls" story, even if it wasn't what I expected (more Subjekt 17, please). And I am getting a real kick out of the Sinestro Corps War storyline in GL and Gl Corps. I will also be re-engaging in "Blogging Countdown" here and at another blog in coming days. Countdown has taken a few bizarre turns of late, including what I think may have been a mass dumping of the writing staff and a replacement crew. Crazy stuff, but after 25 weeks of going absolutely nowhere, the series seems to be richoteing off in an entirely new direction. Whether anyone cares at this point... I've no idea. It is late. I am tired. Good night, Leaguers. Yes, that's probaby an un-CGI'd Rorschach. Thanks to Randy for the forward. Some people have complained that Indiana Jones and the Kingdom of the Crystal Skull is too long of a title, but I dig the pulp, Doc Savage feel of the name. I still am not sure if we get Karen Allen back in this one. And the upcoming Justice League: New Frontier had a press release with some stills and images of box art-work. This was a great, self-contained comic and I think it'll be a great movie. Keep the Car Running = Thunder Road? This morning I was driving into work and listening to Springsteen's "Thunder Road" and it struck me how much parts of the new Arcade Fire album (or, rather, latest Arcade Fire album) sound like Springsteen when Springsteen is at his rocking best. It must have been something nigh-tangible in the zeitgeist. Check out this post on Stereogum. Yeah, that's the E Street Band with Win and Regine playing "Keep the Car Running". Holy smokes. Apparently I was very late in making the comparison, but as I don't think I've read an actual music or album review since college, I missed out on the comparisons at the time of the release of Arcade Fire's "Neon Bible". New Blog Featuring the Baby-Growing Talents of Denise! Our own Denise is about to have kids. No, not a pair of goats, but a pair of babies. And, for once, there is a slight chance one may be named Ryan II. You see, Denise's husband is also named Ryan. 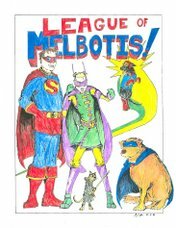 So while she may lead him to believe that she is naming the babies after that guy, we at League of Melbotis know the truth. Check out the Bambino Blog! I had today off, sort of. Technically, I had the day off, but the world of eLearning never sleeps, and so I had to get online and do some work in the afternoon, as well as call a client. Mostly, I just hung Christmas lights. When we bought our house, I knew that the two-tiered porch and columns meant we'd be lighting the whole front of the house. Fortunately, this year, I didn't have to figure out how this was going to work, and I more or less repeated from last year, with a few extra items and ideas I got walking around the neighborhood last year. I also managed to get the tree up, but we didn't decorate it yet. Perhaps tomorrow night. We'll also need to figure out our floor plan for the 2007 Holiday Heckstravaganza and think a bit about getting out the rest of the decorations. Tomorrow is back to the office for a short week, and cramming in the last few weeks before everyone disappears for Christmas, including me. When one is on dialysis, the body does not adjust terribly well to temperature changes, and so, with fall-like weather now upon us, Jamie is getting cold quite easily. I actually woke up last night to her shivering and covered her with a few blankets. I give her a hard time for getting cold during winter, but I know she really does get chilled to the bone. So I don't think she slept terribly well last night until I located the blankets. The dogs, still recovering from their respective Thanksgiving weekends, also spent most of the day asleep. It was nice having a day off and getting some sun and enjoying the cool weather. Do I even need to tell you what that show is? That's right, NBC is doing The League a big favor and bringing 90's late-night viewing fave "American Gladiators" back on the air. 4) USA's "Up All Night"
American Gladiators featured a colorful cast of 'roid freaks doing sportsman-like battle with steroidless athlete-types. Sometimes this included pummeling one another with huge q-tips. Sometimes it entailed the Gladiators shooting tennis balls from a gun at the contestants as they tried to make it through a maze, or climb up a rock wall. Basically it was Malibu beach freaks beating the snot out of one another in games designed to favor the Gladiators. And they wore sort of superheroish costumes. This was back before there was a sort of backlash against competitive women's fitness. Younger readers may not recall, but in the 80's, women joined in with body-building, which meant that the women competitors took on the same, weird muscleliness that the men were aiming for. In recent years, the Ms. Fitness competition took a turn towards being less... uh... about huge muscles and more about being in really good shape. I guess as a high school dude, you feel like you have to pick a favorite. So, anyway: American Gladiators returns in 2008. Be prepared to see 'roid freaks totally wail on one another. CB's latest Musical Recipe is up at Dessert Lounge!